In South Africa, SATI sticks to its initial export estimate despite difficult trading conditions. 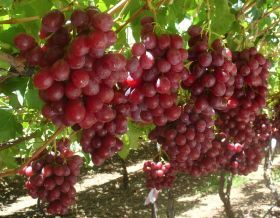 South Africa’s table grape forecast remains unchanged despite the export programme running somewhat behind schedule due to a late start to harvesting. The South African Table Grape Industry (SATI) says it has kept its first export estimate unchanged and the total crop is estimated to be between 63.2m and 70.1 m cartons. This does not tell the full story of what is turning out to be a very difficult season as far as market conditions are concerned. The South Africans have an excellent harvest in most regions and the quality of the grapes is reported to be exceptional due to very favourable harvesting conditions. However, In the most important marketing region for South African grapes, namely the UK and Europe, conditions are tough. The Trump trade war with China has destabilised normal business conditions because of its effect on Californian exports. Seasoned importer Jonathan Olins of Poupart Imports, confirmed that the grape market in the UK and Europe is very tight. “There is simply too much grapes around,” he says. South African exporters will also have noted that the Indian season in Europe and the UK started earlier this year. Bestbier says there is a steady trend of India entering the European and UK markets earlier and this is affecting the traditional South African sales window.